Winter is always getting a bad rap. Newscasters slander cold weather and snow like they are akin to the plague, even though we desperately need the moisture. Everyone complains about this maligned season, as if it was purposely bent on causing them misery. Now surely God didn’t doze off while winter was being created and awaken to find something had gone horribly wrong. So maybe the fault, the lack of appreciation, is in us. Maybe it’s time to quit pouting about how nasty winter is and discover what there is to love about it. 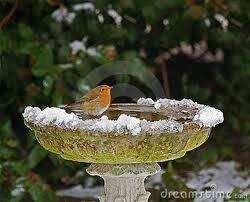 As I write, several inches of snow are piled on my birdbath and car out front, and everything else for that matter. I’m thrilled, enthralled by the loveliness, with nary a care that driving requires more caution or events might be canceled. My eyes, hungry for the beauty, can never get enough of it. A tangible joy settles over me and my house, as the flakes descend from heaven to rest there a while. My soul, usually in hiding from too much frenetic energy surrounding it, has emerged calm and content. I don’t know how the snow has wrought such magic, but surely it has. I invite you to reflect on what snow means to you, what delicious childhood memories bubble up in its presence, and how it makes you feel now. 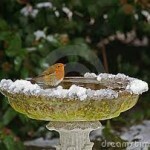 When it snows, take time to savor it with all your senses, and take in its love and lessons. Be still and attentive, and see how the snow—overwhelmed with joy that someone truly sees it—graces you and speaks to you as the voice of God. You can do this with every aspect of winter—the cold, the dark, the dormancy, the starkness. I recall a story in one of Tom Brown’s books where his Native American mentor, Stalking Wolf, taught him and a boyhood friend a valuable lesson about the cold. The boys were in the Pine Barrens woods of New Jersey on a bitterly cold day when Stalking Wolf instructed them to strip down to shorts, a T-shirt, and sneakers and make their way back home some three miles away. Tom recounts how he at first resisted the cold, which made him doubly wretched. But once he truly felt and embraced the cold and no longer perceived it as his enemy, he began to get warm, and felt exhilarated by the time he reached home. I’m not asking you to try that, but perhaps this example can teach us that our attitudes are powerful and can transform our reality. Don’t walk away from winter this year with the feeling in your heart, “I never really knew you.” (and thus, God). Bundle up and get outside even when it’s cold, draw the air in deeply and slough off the stale. Appreciate the gray of sky and sleeping nature that allow your energy to be stilled and your spirit to draw inward. Maybe we need the slower rhythm of winter to balance the whirling beat of summer. Allow yourself to be mindful of hibernation pleasures too—waking up to luxurious warmth under piles of covers, sipping savory tea wrapped in robe and candle light, melting with delight under the stream of a hot shower, or laughing with friends around a cozy fire. Don’t let a winter day go by without new awareness of its hidden treasures, all manifestations of God’s love made tangible. And give God thanks for all the snow and rain we receive, and pray for an abundance of it this winter, so we and growing things have the moisture we need. The water situation in our area is serious, but it is desperate in many places around the globe. Working and praying for adequate water and sustainable water practices and policies should be a part of our care for creation. And come to our program on water next Monday evening at 7 pm at Village Presbyterian Church to see what you can do about it. Winter and New Year’s blessings to one and all!